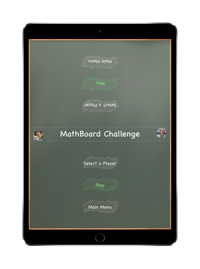 Everything you have grown to love about MathBoard® is now available in a fast-paced, head-to-head math challenge. 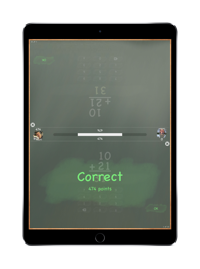 Play against the clock or friends to see how many points you can score, but be careful if you answer the problems incorrectly you will lose points. • Random equation generation for Addition, Subtraction, Multiplication, Division, Squares, Cubes, and Square Root problems. • Number ranges are configurable, including the ability to require certain numbers to be in each problem and the ability to omit negative answers. 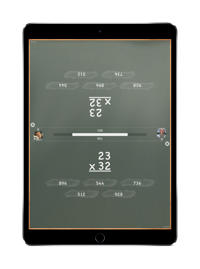 • Number and order of displayed digits can be limited, allowing for equations to conform to certain learning levels (e.g. 2 digit numbers over 1 digit numbers). • Generates simple equations, as well as single step algebraic equations. (e.g. 6+x=12; x-8=2; 5x=25). • Intelligent problem and "wrong answer" generation makes guessing more difficult. • Includes both multiple choice, as well as, fill in the blank style questions. 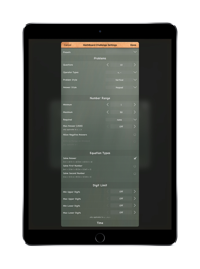 Languages Supported: English, French, German, Italian, Spanish, Thai.